A Urinal is a vessel for holding urinary waste for disposal. It is meant for the patients confined to bed or wheel chair in a hospital or even at home . In fact, it is a portable urinal which enables a person to relieve himself without having to leave the bed or the wheel chair. 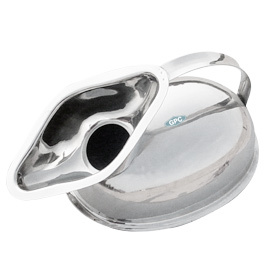 GPC Medical Limited, internationally known manufacturers and exporters of a wide range of hospital equipment & devices, include in the category of Stainless Steel Hollowware, hygienic portable Stainless Steel Handheld Urinals also, separate for men and women although some of the features of the two are common. 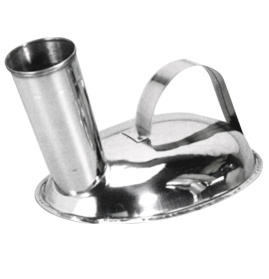 Our Urinals are made from the finest quality of high grade stainless steel. The handle, attached to the Urinals, make them convenient to carry them. The Urinals are corrosion and chemical resistant. They can be autoclaved and cleaned easily. Thus they are reusable. Our Stainless Steel Urinals, in big quantities, in addition to our regular models, are produced as per the individual requirements and exported to various countries across the world. 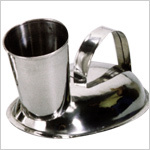 Send Your Buy Requirement For "Urinals - Stainless Steel" AND Get Quote Quickly.